After 10 years, 1000+ petition signatures, a written mandate from past Planning Director Bob Cotter and past DPW / Parks & Forestry Directors Mark Redfield and Rodney Hadley, a letter of support from the Jersey City Environmental Commission, as well as a recent verbal agreement from Director Pat Stamato and Councilwoman Denise Ridley, and even finger wagging from Mayor Fulop citing the new JC Tree Ordinance, a private agreement was apparently made between City Officials and the DPWA (association board for Society Hill & Droyers Pointe) and their contractor Falcon Engineering, to cut down ALL of the 84 mature Shelterbelt of Trees on the waterfront public access walkway around Society Hill. The 84 permits to cut down these trees can be revoked! Urge Governor Murphy to step in and stop the destruction of this protective Shelterbelt of healthy mature Trees in Jersey City. The loss of this environmental resource and wildlife habitat is orchestrated by business interests and sanctioned by local government, and must be rejected. Our state must prioritize the public's health and environmental welfare in balance with economic decisions. Our 10 year journey to protect the unnecessary destruction of the 84 mature Shelterbelt trees on the public access walkway is hopefully drawing to an end… but it's not over until its over… and your continued support is still needed until the walkway is repaired and the trees are properly maintained. Mayor Fulop and City Hall officials from Jersey City continue to provide support, and we look forward to their continued assistance. The City's past and continued efforts to insure against irreversible and unrepairable harm to these mature trees and wildlife habitat is greatly appreciated. We also hope that the requirement of an ongoing maintenance plan (per the March 2016 City Planning and DPW Letter to the DPWA) will remain in place as a requisite to DPWA, insuring that future public access, walkway safety and maintenance of a healthy tree regimen become normal operating procedure. The info below from JC officials will provide an update on what has been happening, and what still needs to happen, and how future matters will be handled. Q: Has the City completed its review of the walkway and the Shelterbelt of 84 trees? A: The City conducted its own assessment of the trees along the problematic portion of the public walkway and then met with DPWA's team to discuss their findings, which findings differed from those of the DPWA team. The City's Department of Public Works met with DPWA's arborist and landscape engineer (Falcon Engineering) and examined the trees. It was determined that several trees would need to be removed but that the majority could remain in place with the assistance of some root management work. The DPWA will submit individual permit applications to the City for each tree they plan on removing. Each permit application will include details about the type of replacement tree to be planted after removal. Q: Is a formal update on the City's assessment and position on the matter, and future next steps pending? Q: How many trees are referenced as "several", and how many trees are referenced as "the majority"? A: My understanding is that the City flagged approximately 15 trees for removal. Q: What is the timeline to remove and replace these "several" trees? A: The next step in the process is for DPWA to submit individual permit applications for each tree that requires removal or remedial root maintenance. The timeline is difficult to predict, as it depends on when the City receives the permit applications and whether those applications require further revisions. Answers to the questions below are still pending. Which 15 trees have been designated to be removed? Some trees will have root maintenance done. Since root shaving is a specialized skill, who will handle that task? The March 2016 Letter from City Planning and DPW provides a thoughtful and comprehensive plan of action. Are these official recommendations intended to become part of the final assessment report being prepared? The March 2016 letter from City officials also references the need for the creation and implementation of a maintenance plan by the DPWA moving forward. This, of course, is intended to avoid future complications with the public access walkway and insure the proper on-going care for the Shelterbelt of trees. Who will develop this maintenance plan and where will the maintenance plan reside for the benefit of oversight and compliance? This would insure clarity, manage future expectations and assign appropriate responsibilities - we should never again need to endure the lengthy neglect of this valuable environmental resource and wildlife habitat, and risk public safety with ignored trip hazards. Accordingly, will all the trees now be properly cared for and pruned as part of this project? When will the official assessment report be made available to the public? The DPWA has not held a meeting since April and is not providing any information about next steps, time-lines and future maintenance details (which our association dues fund). There has historically been a set of circumstances that have deprived stakeholders of full and transparent awareness of plans about and for this public access walkway and tree Shelterbelt. Jersey City residents expect to be provided with answers to these questions. Ideally, this would occur before any work commences. Our public access walkway deserves to have a clear, proactive and comprehensive maintenance plan in place to serve Jersey City residents, and our environmental needs. Without a plan, the current deteriorative condition of the walkway may persist. For the Friends of the Walkway and our supporters, this has been a 10 year mission to see a resolution to this matter, and we remain committed to seeing it through to a successful end. 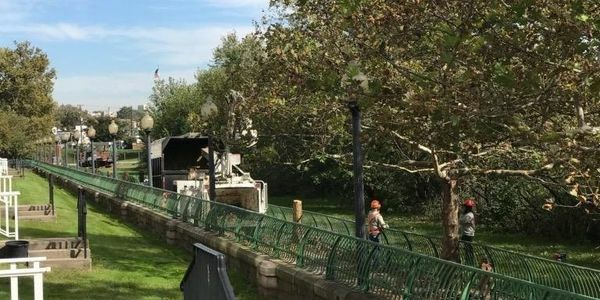 The Droyer's Point Walkway Association Board (DPWA) voted to remove the 84 mature trees on the riverfront walk at Society Hill. This is in opposition to the March 2016 City of Jersey City Letter that clearly details steps to repair the walkway trip hazards, and provides protected status of these 84 Society Hill Shelterbelt of Trees, which provide a protective, natural green buffer and tree canopy. A single arborist hired by the engineering firm contracted by the DPWA to lead the walkway repair project advised this action. This would have an enormous environmental impact, and would increase the walkway project costs - $107K just to remove the trees. There have been many expert assessments of the trees by City Agencies (Jersey City Department of Public Works, Jersey City Department of Housing, Economic Development & Commerce - Division of City Planning, and Jersey City Environmental Commission) which resulted in the March 2016 letter; and several other City Agency letters to the DPWA since 2010 which differ from the assessment by the engineering firm hired tree expert, i.e., these trees CAN be root shaved, maintained properly and thrive without posing a public risk. Qualified organizations with certified experts (Sustainable Jersey City, New Jersey Tree Foundation and Jersey City Parks Coalition) have offered the DPWA support and guidance regarding this Shelterbelt of Trees, and also advocate for saving the Shelterbelt of Trees and the substantial eco system benefits the 84 mature trees provide. The Friends of the Walkway ask you to please join them in taking action by signing this petition that supports that each tree be evaluated individually, and if needed that shaving the root (done under supervision of a NJ-certified arborist) is the best option for our community and the environment. We do NOT support the extreme solution of removing healthy mature trees. A handful of unhealthy trees (3-6) may need to be removed and replaced, but not all 84. Only 5 of the 84 Shelterbelt trees remain, and they will probably be gone by tomorrow. This is more than a shame. Come to the Jersey City - City Council meeting tonight (10/24) at 6PM at City Hall - 280 Grove Street. Join all the Friends in support of environmental advocacy for Jersey City. Ensure your voice. Destruction of the 84 Shelterbelt Trees started yesterday (10/19)... even after the Jersey City Environmental Commission issued the DPWA a letter on Wednesday (10/17) that indicated that trees deemed healthy, as per the Jersey City Forestry Standards, remain on the walkway and requested an explanation from the DPWA regarding this plan prior to tree removal. Permits to cut down remaining trees can be revoked! PLEASE Take Action TODAY! Trees may be cut down starting tomorrow. Info in petition re: details to provide during call. Please continue to spread the word and send out the petition to others for signatures, comments & calls. Thanks so much for the continued support! City Approves Destruction of 84 Mature Protective Shelterbelt Trees on waterfront public access walkway. TAKE ACTION TODAY! Our 10 year journey to protect the unnecessary destruction of the 84 mature Shelterbelt trees on the public access walkway is hopefully drawing to an end… but it’s not over until its over… and your continued support is still needed until the walkway is repaired and the trees are properly maintained. See the petition for a complete update. Please forward to others for signatures.